To whom it may concerne! The previous Fundamental Rules, Procedure Regulations and all other Rules & Regulations were reviewed in order to deliver a clear structured set of rules, together with an adaption to unify the Rules & Regulations of European professional league play. As the EBEL/AHL GameBook is designed in an European context, the language of the EBEL/AHL GameBook is English. 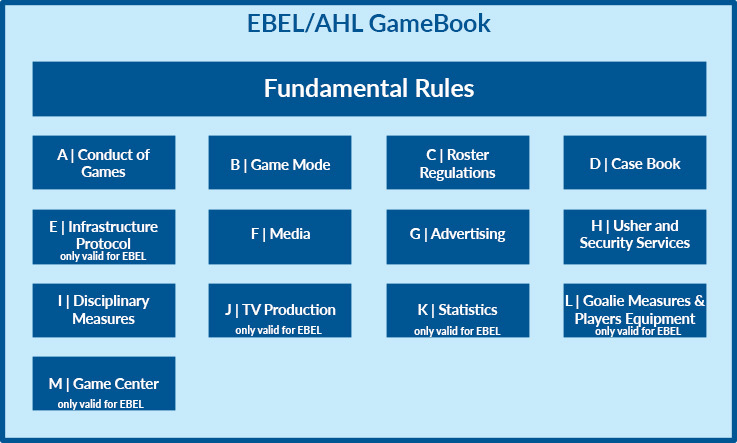 The following graphic gives a detailed overview of the different parts of the new EBEL/AHL GameBook. Any additions or changes will be published on www.gamebook.at after a notification to the official EBEL/AHL mailing list.